Consumer Reports, the original keep-'em-honest consumer advocate and the forerunner of today's review sites, ran this full-page ad in today's New York Times. 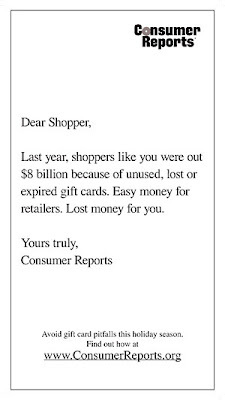 An unusual move for them-- they rarely advertise-- but the $8 billion fact they put out in this ad is certainly interesting enough to spark a lot of conversations about the value of gift cards and the number that go unused. I know it did at the Toad household, where I'm estimating we've got a few hundred dollars of unused cards sitting in a desk drawer somewhere. Curious to see if this sparks a backlash of any sort, or even just a lot of conversation on marketing/consumer sites. And if CR picks up any new subscriptions because of it. The (obvious) trick to gift cards is see if they have an expiration date or not. Many don't, but some do. But they're required by law to disclose the info right on the card (usually in 2-point type on the back, but still). Nah, the trick is to use them that week. Otherwise they sit in a drawer or get lost or thrown out or otherwise permanently forgotten. Oh so this is how we're funding the war on terror. I was wondering from where they were siphoning the extra 7 billion. btw, the best gift card trick I've ever seen: my friend's bday party and his wife told everyone who asked "get him a gift certif. to Best Buy". He musta wound-up with 1k. So he put it towards a laptop. Or a TV. Smart wife has he.